Durga Puja, the annual festival in honor of Goddess Durga, begins tomorrow, September 26 and continues until Saturday, September 30. It’s a moveable festival with dates coinciding with the sixth through tenth day of the bright lunar fortnight in the Hindu month of Ashvin. For five days revelers in Kolkata engage in pandal hopping, food, music, and cultural evenings to welcome Durga back to her paternal home. Durga, consort of Lord Shiva, also manifests Parvati, Kali, Shakti, and Devi in her feminine pantheon. Durga is a warrior goddess. 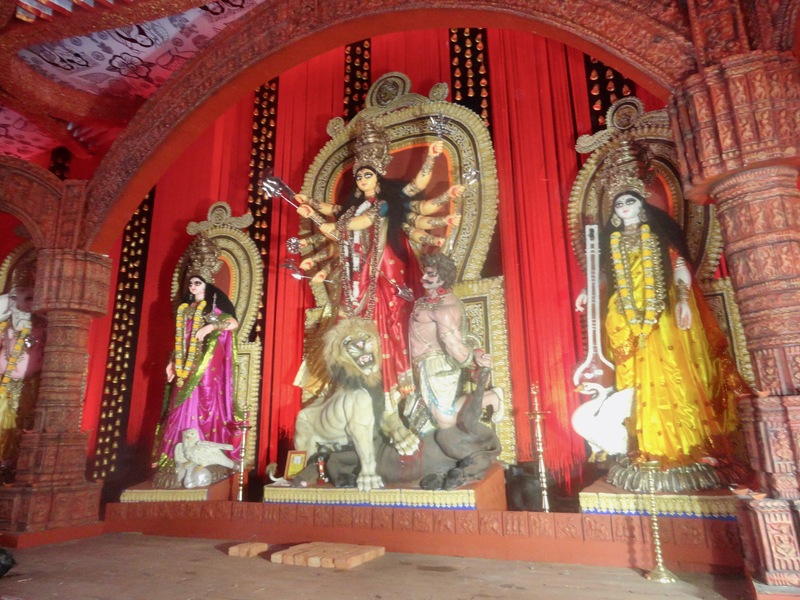 The Durga Puja festival marks her victory over Mahishasura, a shape-shifting demon. More holistically, Durga represents the victory of good over evil. Durga combines the powers of Goddesses Lakshmi (prosperity), Kali (time), and Saraswati (knowledge). 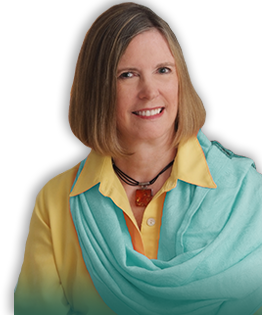 most often she’s depicted with eight. In each hand, she holds a weapon of her teachings on overcoming evil. The chakra in her upper right hand is for dharma, the duties we perform in life. The conch in her upper left hand stands for happiness with which we perform our duties. The sword in Durga’s second right hand represents the eradication of vices. Her second left hand holds a bow and arrow meaning we must retain our values in the face of difficulties. The third lower left arm holds a lotus for detachment, while the club in her right hand is for devotion and surrender. The trident in her fourth left lower arm is for courage to face challenges. The fourth lower right hand is for forgiveness of ourselves and others. 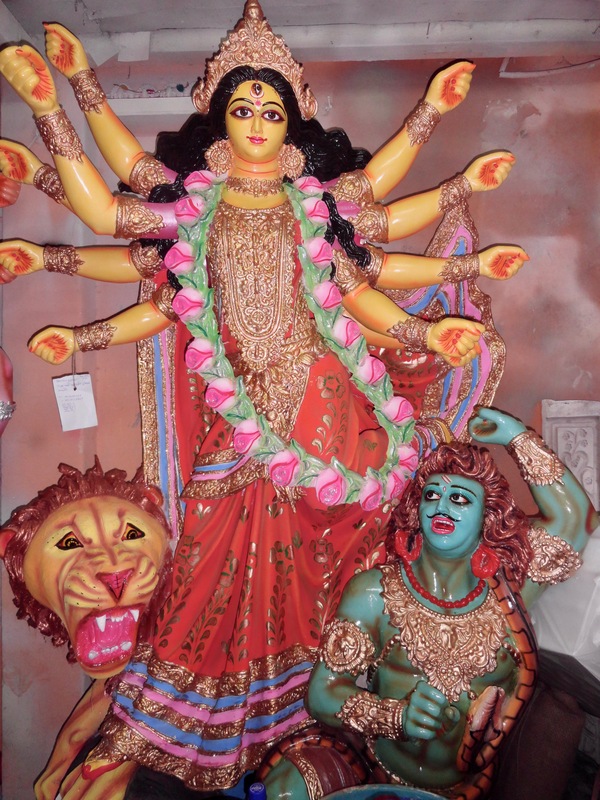 Durga’s vehicle is the lion symbolizing her unlimited power to protect virtue and destroy evils such as anger, arrogance, greed, jealousy, and the desire to harm. Usually Durga is clothed in a red sari. The color red is for action. 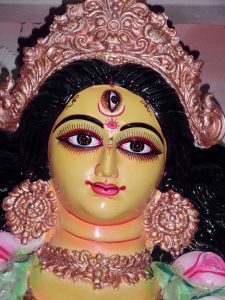 Durga has three eyes. The left eye, symbolized by the moon, is desire. The right eye symbolized by the sun is action. And the middle eye symbolized by fire is for knowledge. 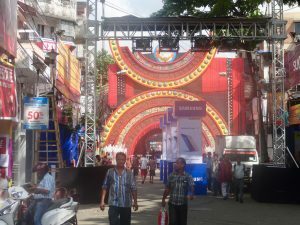 During the festival, temporary pandals (structures to venerate gods) are built. Within, workers construct tableaux of Durga with Lakshmi, goddess of wealth, to her right, and Saraswati (goddess of knowledge) on her left. The video shows pandals at night – elaborate and glittering. I find the reference to Disneyland entertaining. At the end of the festival, everything is dismantled, and the images taken to water where they at one time returned to their natural state. In modern times artists have been using non-biodegradable materials and lead-based paints to create more striking figures. Efforts now take place for a return to biodegradable materials. Nivedita Ganguly. “Durga Puja, the Bengali Way.” The Hindu. Sept. 23, 2017. Stay Kalra. “What does Geddes Durga Symbolize?” India Currents. Oct. 18, 2012. Shri Ryan Rajahs. “The Goddess Durga is the Mother of the Hindu Universe.” ThoughtCo. Sept. 18, 2017.